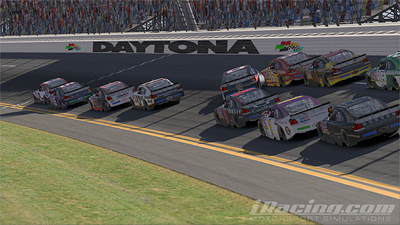 The 2012 iRacing Daytona 500 was a huge event with over 1600 racers taking part. In previous years this volume of racers has caused major problems with the event (such as major delays and even postponement) but iRacing have invested resource into changing the infrastructure powering the event to handle the large volume – and this year it paid off. The event ran without a hitch as my race session saw 38 race splits for a truly epic event (I made split 6). The race itself was good fun with everyone taking it pretty easy and keeping it respectful, and we had long green runs for large portions of the race. 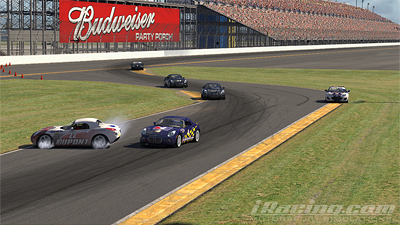 I had two major incidents during the race – lap 123 had a pretty big wreck that I made it through (reasonably) unscathed. Towards the end of the race I was in very good shape and firmly in the lead pack racing for the win. As we saw the ten to go my luck ran out when a car on the inside line completely lost control, demolishing my car and causing “The Big One”, sending me down the track on my roof for 500m+. A 5 minute tow followed by a 5 min partial repair and I limped it home in 16th place. Still, not a terrible result and I saw the chequers, albeit 7 laps down. 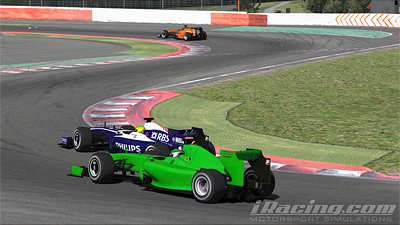 The next event in the iRacing 2011 World Tour recreates the Formula One Belgian Grand Prix. Run on the same weekend as the real world series, this event sees the first time that the iRacing FW31 is used in a World Tour event. Last years World Tour had a similar event to coincide with the British Grand Prix but unfortunately the FW31 wasn’t released fast enough to be used, so we used the Lotus 79 for a classic style event (my race writeup for that event is here). 363 racers participated in the event, forming 14 individual race events. I started 10th in my split (the fourth split). I was pretty concerned about getting wrecked in turn one (especially as I had been looking forward to this race for a long time and had put a lot of practice in) and sure enough it was a very messy start. Luckily I picked my way through the spinning cars and no-one hit my car. I settled into what turned out to be a really enjoyable race. I had decided to go for a one stop strategy and it turned out that a lot of the field had chosen two stop strategies. So as the race progressed the cars that drove away into the distance at the start eventually came back into play once the pit stops had worked their way out. In the final third of the race I checked the race order and found that I was in a very good position – all the cars ahead of me had another stop to make. Sure enough, I soon found myself in first place with a 10+ second lead, and brought it home for a very memorable win! There is a similar World Tour event in October to coincide with the Japanese Grand Prix at Suzuka – a great track.